Give pests their eviction notice, up to 4,000 sq. ft.! SAVE BIG! Repel dogs, cats, deer, raccoons, armadillos, opossums, bats and other pests from yards, gardens, warehouses, garages, basements, attics, restaurants, barns... wherever they roam. 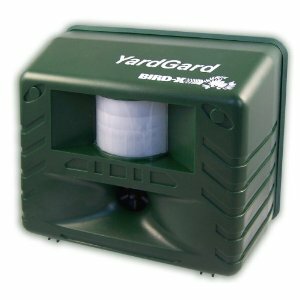 Independent laboratory testing has proven Yard Guard sound technology to be a highly effective form of pest control. An infrared motion sensor activates the Yard Guard when a pest moves into its range, then sonic and ultrasonic sounds send them packing! Mounts easily with keyhole slots, and offers coverage up to 4,000 sq. ft. Humane, effective, maintenance-free, and without expensive and hazardous chemicals. Has an AC cord, or can use four C batteries (not included). It's 6 1/2 x 4 1/2 x 3 3/4", 15 1/2 ozs. Frequency Range 14,000-25,000 Hz. UL / CUL and EPA-listed, assuring it's safe. Protect your property the easy, safe and affordable way with commercial-grade Yard Guard! Order quick, for less! Yard Guard Animal Repeller. Built-in infrared motion sensor activates when pests move into its coverage zone.